Quentin Tarantino is known for both labored dialogue and extreme, sudden violence. Those two elements have always been his main calling cards. One thing that he has never been associated with is nonstop action. Though his movies contain their fair share of bloodletting, they aren’t particularly fast moving. His characters often spend way more time talking to each other than they do shooting at each other. Nevertheless, the international trailer for Django Unchained shows both the title character and his white liberator to be very trigger happy. For the most part, this trailer is the same as the one that premiered stateside last week. Certain moments have been extended just a bit, most notably the opening rescue in the woods. There’s also a lot more shooting. Blood doesn’t just spray on cotton this time around, it falls in globs. Broomhilda (Kerry Washington) is shown being doused in water while locked in a pillory. More than anything else, the amount of misogyny directed at the film’s lone female character troubles me. I don’t want Quentin to hold back on the gory details of man’s inhumanity toward man during this period, but I also don’t want him to wallow in them, either. 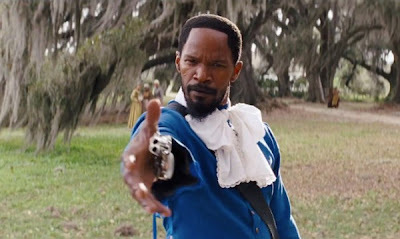 However, I do love the way the film seems to revel in Django gunning down his enemies. I also like the superhero iconography that is used to depict him. There’s something superheroic in the way he throws off that ratty shroud after being rescued. Though it’s highly unlikely that Django Unchained will be an action packed romp, this trailer hints at it being just that. Still, I suspect that the fireworks will come mostly by way of the dialogue. If Quentin has finally found a happy medium between action and dialogue, Django Unchained will truly be a wonder to wonder to behold.